Saint Turibius of Mogrovejo - My Catholic Life! Today’s saint was the second Archbishop of the second most important city in Spain’s Latin American empire in the 1500s. Lima, Peru, stood only behind Mexico City in importance to the Spanish Crown during the pinnacle of its colonial ambitions. So when Lima’s first Archbishop died in 1575, the King of Spain, not the Pope, searched for a suitable candidate to send over sea and land to replace him. The King found his man close at hand, and he was more than suitable to the task. Turibius of Mogrovejo was a learned scholar of the law who held teaching and other posts in Spain’s complex of Church and civil courts. Yet for all his learning, piety, faith, and energy, there was one huge obstacle to him being a bishop. Turibius was not a priest. He was not even a deacon. He was a very good, albeit unmarried, layman. The arrangement for centuries between Spain and the Holy See was that the Spanish Crown chose bishops while the Pope approved, or rejected, them. So after the Pope approved the appointment, over the candidate’s fierce objections, Turibius received the four minor orders on four successive weeks, was ordained a deacon and then ordained a priest. He said his first Mass when he was over forty years old. About two years later, Turibius was consecrated as the new archbishop, and then sailed the ocean blue, arriving in Lima in May 1581. Archbishop Turibius was extraordinarily dedicated to his episcopal responsibilities. He exhausted himself on years-long visits to the parishes of his vast territory, which included present day Peru and beyond. He acquainted himself with the priests and people under his care. He convoked synods (large Church meetings) to standardize sacramental, pastoral, and liturgical practice. He produced an important trilingual catechism in Spanish and two native dialects, learned to preach in these indigenous dialects himself, and encouraged his priests to be able to hear confessions and preach in them as well. 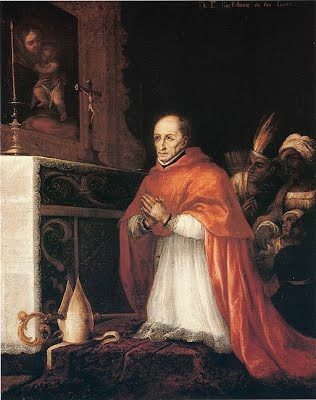 Archbishop Turibius’ life also providentially intersected with the lives of other saints active in Peru at the same time, including Martin de Porres, Francisco Solano, and Isabel Flores de Oliva, to whom Turibius gave the name Rose when he confirmed her. She was later canonized as Saint Rose of Lima, the first saint born in the New World. Saints know saints. Archbishop Turibius was a fine example of a counter-reformation bishop, except that he did not serve in a counter-reformation place. That is, Peru was not split by the Catholic versus Protestant theological divisions wreaking such havoc in the Europe of that era. 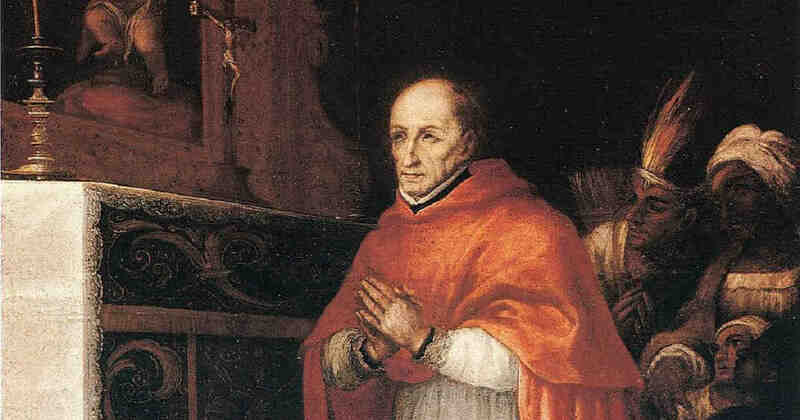 Saint Turibius implemented the reforms of the Council of Trent, not to combat heretics, but to simply make the Church healthier and holier, Protestants or no Protestants. From this perspective, the reforms of Trent were not a cure but an antidote. If Turibius’ energy and holiness were motivated by any one thing besides evangelical fervor, it was his desire to make the Spanish colonists of Peru recover the integrity of their own baptisms. The indigenous population needed authentic examples of Christian living to respect and emulate, and few Spanish colonialists provided such models of right living. Saint Turibius’ greatest enemy, then, was simply original sin, which returns to the battlefield every time a baby is born. After exhausting himself through total dedication to his responsibilities, Saint Turibius fell ill on the road and died at age sixty-seven in a small town far from home. His twenty-four years as Archbishop were a trial of strength. He had baptized and confirmed half a million souls, had trekked thousands of miles on narrow paths made for goats, had never neglected to say Mass, and did not accept any gifts in return for what he gave. Turibius was canonized in 1726 and named the Patron Saint of Latin American Bishops by Pope Saint John Paul II in 1983. Perhaps his unforeseen ordination explains his sustained fervor and drive. What came late was valued for having come at all. He bloomed late and bloomed beautifully, becoming the Spanish equivalent of his great contemporary, the Italian Saint Charles Borromeo. Saint Turibius, we invoke your intercession to inspire all who share the gospel, in whatever form, to do so with ardour, skill, and charity, using all the means at their disposal, as you so powerfully did in your own life and ministry.